Chat users has been faced many problems on flash chat based websites recently. One of these sites is Chatrandom. If the website doesn’t work on your computer or if it is giving errors, we are going to guide you on this page for you. We hope that you will able to help you for fixing the problem. The problem may occur because of many reasons. It can be because of slow speed internet connection, broken flash files, outdated flash or browser version, DNS services, cookies and windows or antivirus firewalls. You will need to check all these stuffs carefully on your computer. You will get a large solution on here to resolve the Chatrandom Doesn’t Work issue. Let’s begin to tell you how to get rid of these Chatrandom errors. You can find all reasons at the following paragraphs if ChatRandom doesn’t work on your computer or mobile device. We recommend you to check all these steps below to get more information. You will find all Chatrandom solutions below and learn how to fix these problems. In this situation Chatrandom won’t work at all. If the website is blocked in your country you will need to set up a few things on your computer. When a website has been closed by court judgement, you will need to use some programs to unblock it. We will give this information to you another page. Click here to learn how to clear flash storage. If it didn’t work for you please go next step. There are several tools and websites on internet which you can check your internet connection. Google it and you will find some. The best one is Internet Service Provider’s… They generally provide this service for customer support. If you know the official website of your ISP, go there and check your connection. If it is slow, contact them, ask them to fix slow connection problem. If you are not updating your browser properly, your browser and flash won’t work properly. An outdated flash will block you to use flash based chat sites like Chatrandom. So you will need to update your browser. If your browser doesn’t update the flash automatically, then you will need to check your flash version manually from the official website of Adobe Flash. If it’s not the newest version, the website will give you instructions about how to update it. If your flash is already up to date, try reinstall the flash to your computer. Firstly you will need to uninstall the flash first from your computer. After you have uninstall the flash use CCLeaner program to get rid of some trash files of the extensions and programs. Then install the flash again and check the website. If your antivirus has family setup, that may block some sites for you and the website can be one of them. You can take a look at firewall settings of your antivirus, if there is anything about parental or family on options, try change that setting. You will also need take a look at firewall settings of your antivirus program. If you ever see anything related with cam, camera, chatrandom, disable that option because they use to stop your cameras. Also check your Windows firewall settings too. Have you ever used DNS settings for your computer. If the website didn’t pass some DNS services security tests, then they will disable to site. We recommend Google DNS for you. You will already get instructions how to change it on the website. We also recommend Google Chrome for chatting on internet. This error is generally occurs because of the servers or system of the website. Click here to get more information and follow the guideline to fix this unable to connect to chat server due to security error on ChatRandom. If you are having another error or problem and Chatrandom not working for you please comment this page and let’s know about the issue. You can find questions at the following paragraphs which has been asked by How to Chat Online users. Chatrandom doesn’t work properly in my PC. I am using Windows 10. My camera is working but I’m not connecting to others. I am using Safari on Windows. The spinning wheel is on their screen and never connects. Thanks for the question and contacting HowtoChatOnline Q&A service. Firstly we recommend you to clear caches and history of your browser. I believe you know how to do that on your browser. 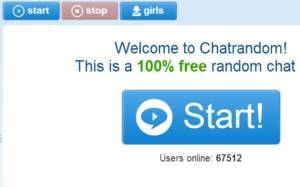 We recommend you to use Google Chrome for random chatting sites. If you are not using Chrome, better if you have one. You will able to use most of flash platforms without having any problem. May be you also need to clean your flash storage.